Are you still looking for the best gifts for your friends? At Rodrigo, by purchasing at least 3 items, you get an immediate 20% off. 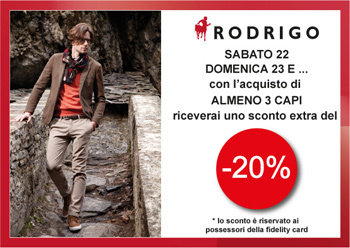 Come and see us at Rodrigo stores in Porto D’Ascoli and Chieti on 22nd and 23rd December. Show this coupon and… take note, the offer is for In-outlet card owners only!